Late yesterday afternoon, Michael and I had decided to enjoy the beautiful weather along with watching the birds and the squirrels feed. Because there was so much backyard activity I had my camera ready (every day there seems to be a new bird or critter). 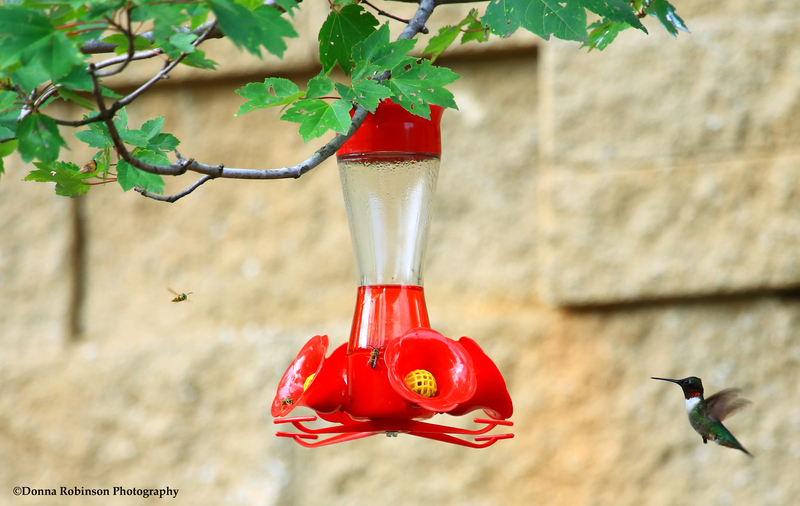 I had noticed the Hummingbird Feeders were getting low, and because it had been so long since I originally filled them, I assumed the nectar was evaporating or the bees/ants were drinking it. So, I went ahead and cleaned them out and refilled them. As luck would have it, I had just laid my camera down on the table, when Michael pointed to the newly filled feeders! There he was our first Hummingbird of the year! I think he was glad I had refilled the feeders because he took several sips! I’ve read Hummingbirds have been known to migrate back to the same area each year. I wonder if this little guy is a repeat visitor? Hopefully, as the weather continues to warm and the flowers bloom, the other Hummingbirds will be returning soon. Awe. Thanks so much…..They are fascinating little creatures! Thanks for stopping by…..Happy Gardening! Beautiful pictures, especially the last! Sure signs of spring, how wonderful!! we had very light snow flurries Sunday and believe it or not again today! !